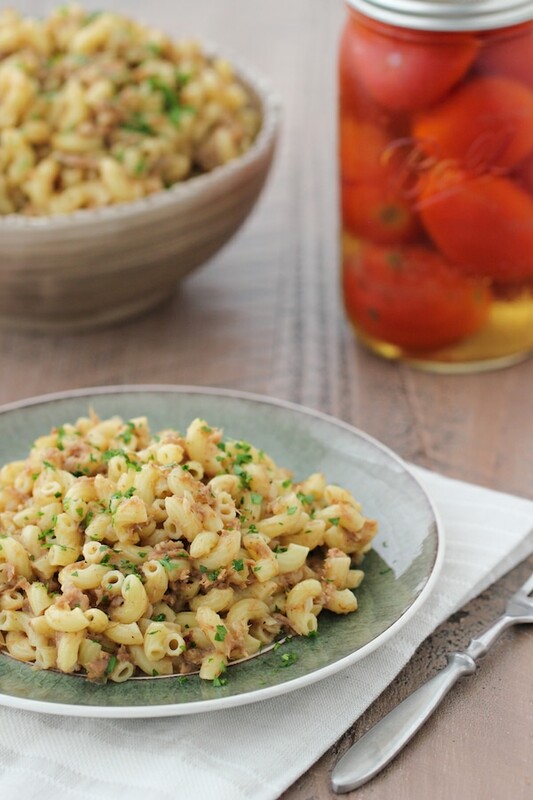 Makaroni Po Flotski has been part of the Russian kitchen since the age-old Soviet years. It is said that men in the Navy would prepare this dish quite often, hence the name. Out at sea, there weren’t many options or variety in the available ingredients, so they used what what they had, canned meat and pasta. There are two different variations of this that I’ve seen and actually, I grew up with both. 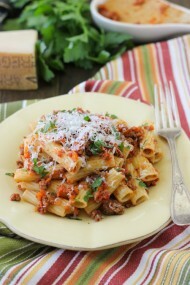 The first option is using ground meat, browning it in a skillet with onions, adding a bit of tomato sauce or paste and then mixing it with cooked pasta. 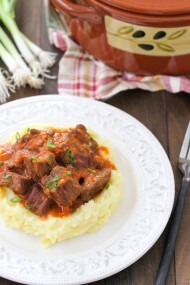 The second is to use cooked braised meat, often times it was canned, called Tushenka. I don’t can meat, so I use a simple pulled pork. 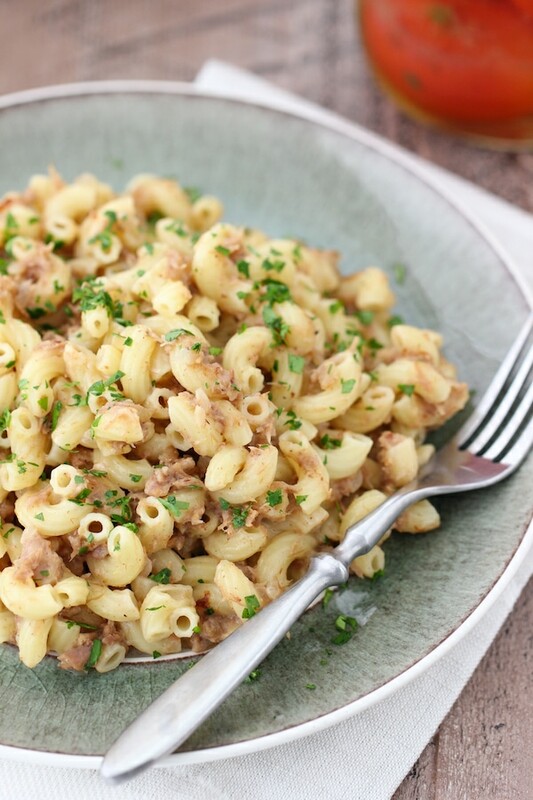 Pork is the most common meat that was used for Makaroni Po Flotski, but you can use beef or chicken too. I often use chicken that I used to make chicken broth for this recipe. 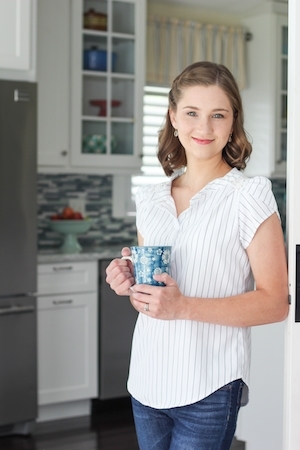 It’s a dinner on the fly option, especially since you use meat that has been cooked ahead of time. 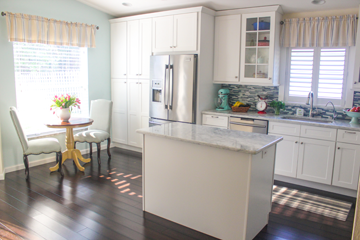 The whole family will enjoy this comforting and simple meal. The juicy and flavorful meat is paired with caramelized onions and a simple sauce and tossed with elbows. My husband absolutely loves this dinner and I’m more than happy to make it, since it makes dinner prep a cinch for me. 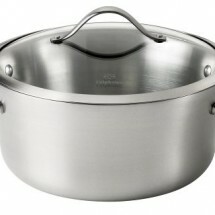 Bring a pot of water to a boil and cook 1 pound of elbows pasta according to the package instructions or however you like them. 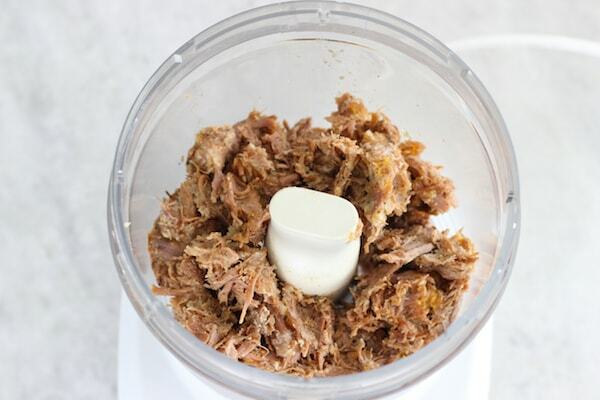 Place 1 cup of cooked pulled pork in a food processor. Pulse until the meat is nicely ground. You don’t want it to be a puree, but it should definitely be on the smaller size. 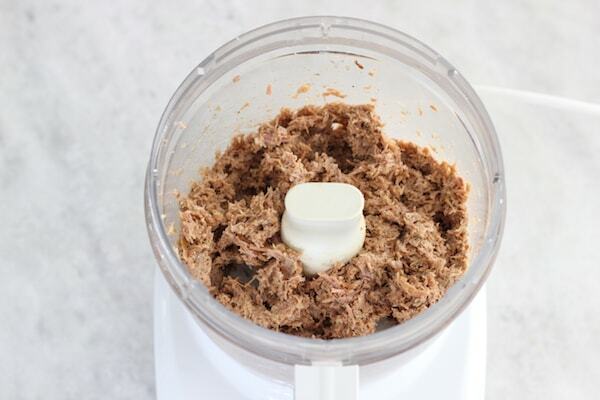 You can also use a meat grinder instead of the food processor. In a skillet, melt the butter. 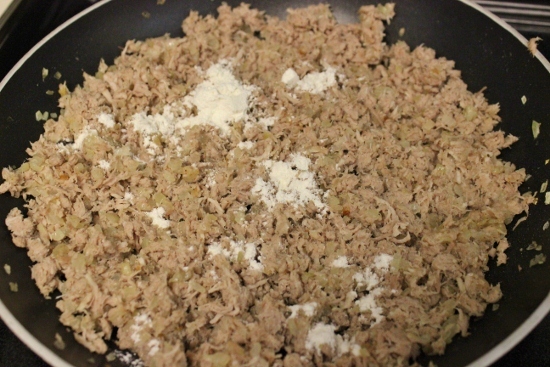 Add the minced onion, season with salt and cook on medium heat until the onions are tender and slightly golden in color. The caramelized onions will give a lot of really great flavor to the dish. 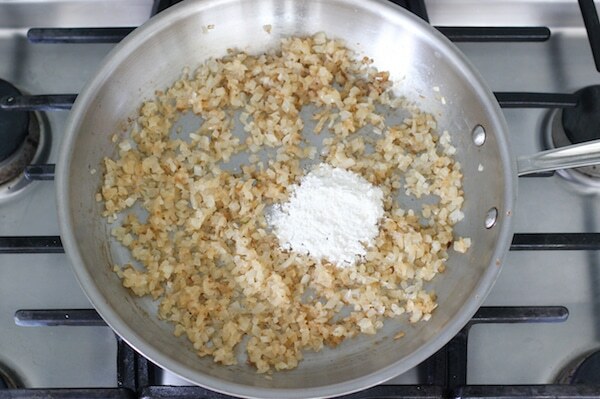 Add the flour, mixing to incorporate into the onions. Adding flour is optional, but I really like that it gives this dish a subtle, velvety sauce. The sauce is barely noticeable, but it helps to coat the pasta with extra flavor and smoothness. Add the meat to the skillet. Increase the heat to medium high heat and continue cooking until the meat is heated through. You can cook it slightly longer, so that the edges of the meat get golden around the edges. The meat should still be tender for the most part, with nicely browned bits here and there. This also improves the overall taste of the dish. Add the broth and cook for another 3-5 minutes, scraping the bottom of the skillet to get all the brown bits from the bottom. Mix until the broth thickens. Use more or less broth, depending on how “saucy” you want it to be. You can use chicken broth or reserve some of the cooking liquid that was used to cook the meat before you reduce the rest of it for the Pulled Pork. Add the meat to the pasta. Mix and garnish with fresh herbs. 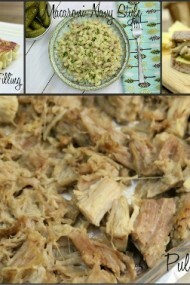 Place 1 cup of cooked pulled pork in a food processor. Pulse until the meat is nicely "chopped". You don't want it to be a puree, but it should definitely be on the smaller size. 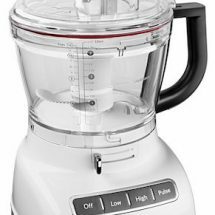 You can also use a meat grinder instead of the food processor. In a skillet, melt the butter. 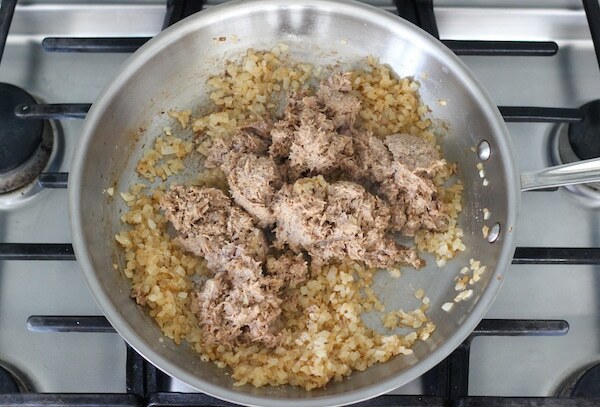 Add the minced onion, season with salt and cook on medium heat until the onions are tender and slightly golden in color. The caramelized onions will give a lot of really great flavor to the dish. Add the flour, mixing to incorporate into the onions .Adding flour is optional, but I really like that it gives this dish a subtle, velvety sauce. The sauce is barely noticeable, but it helps to coat the pasta with extra flavor and smoothness. Add the broth and cook for another 3-5 minutes, scraping the bottom of the skillet to get all the brown bits from the bottom. Mix until the broth thickens. Use more or less broth, depending on how "saucy" you want it to be. I’m starting to crave this dish now too, Ani. I hope you like it. Bolshoi spasibo for introducing me to the favorite dish of the Russian Navy. ( I got the link from Moscow Times). I spent quite a lot of time going through the bolgsite. I have been visiting Russia/CIS for regularly since 1988, and enjoy some local dishes, especially the common dishes and soups. I tried the Makaroni PF just now (being originally from India I usually add some spices, flavoring the cooking oil with cumin/mustard and coriander as well as the meat with ginger/garlic and green chilli)Today I scored big kisses from my wife of 37 years for the MPF so thank you. I look forward to trying the Plov and some seafood and soups. I love the easy to follow text and stimulating pictures. Wish you all the best. I’m so glad you stopped by and tried out the recipe. It sounds delicious with the addition of all the spices. 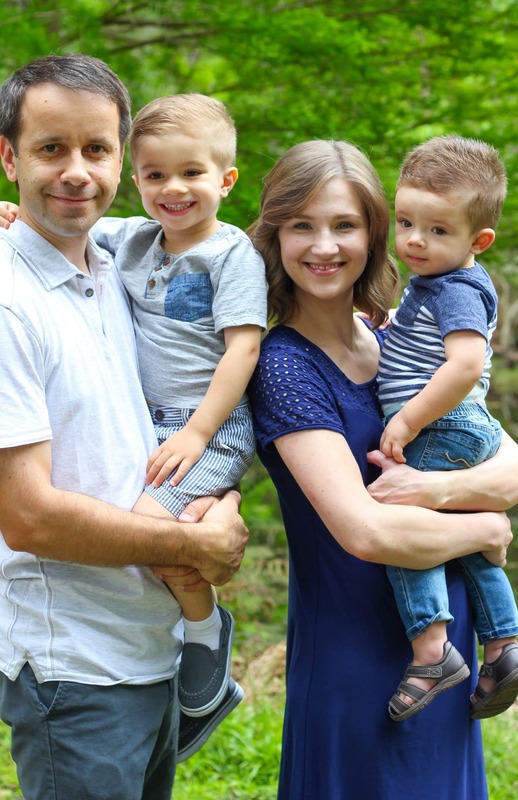 So glad that your wife enjoyed it too:). 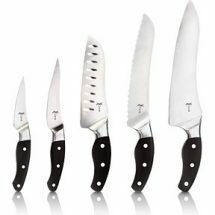 I’d love to hear what you think about any other recipes you try. also Asghar just for a little more background plov is actually originally an Uzbek cultural dish but a lot of russians know how to make it because Uzbekistan was part of the soviet union its very comparible to fried rice accept a lot more spices and within the culture food is made very similar to that of middle eastern and south asian cultures and other Muslimcultures lots of lamb lots of currey is used lots of coriander and mustard seed salt and pepper also paprika are by far the most common spices also i greatly recommend to try a soup called lagman its reallllllyyyyy good i just dont know how to make it but its soooo good. There certainly are many different variations for this dish. Your variations sounds delicious too, Natasha:). Mushrooms are a great addition. Ah, the memories… 🙂 I actually have some leftover beef so will make this tonight. That’s for sure, Tatyana. Food brings so many nostalgic memories for me too. Enjoy the meal. This is my modified version that uses ground beef. 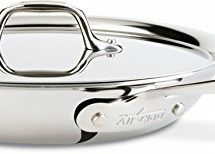 remove from pan and drain grease. 3. 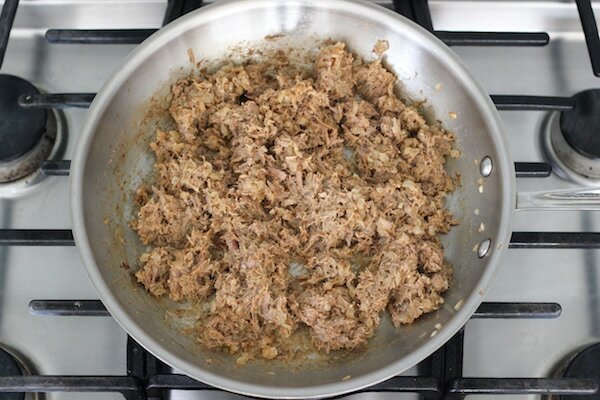 Add Ground beef to dish mix together lightly brown beef. 4. Add flour and stir in meat mixture. 5. Add chicken broth, parsley and 1/2 tsp of salt mix together and cook for 5 minutes. on medium for 20 minutes stir constantly. What sort of broth do you recommend? Hi Olga! 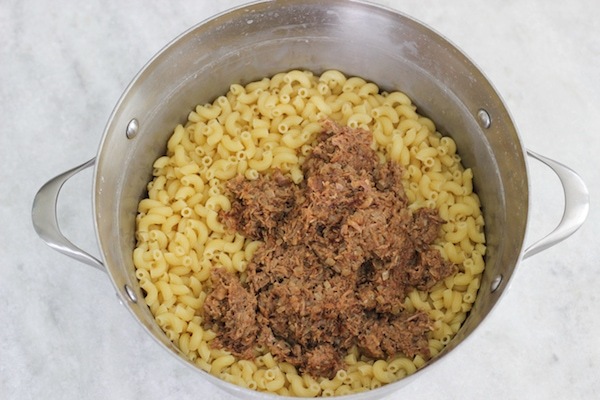 I made pulled pork in Instant pot yesterday (your recipe) and made this macaroni today using the pulled pork – came out absolutely delicious! Thank you so much for both recipes! 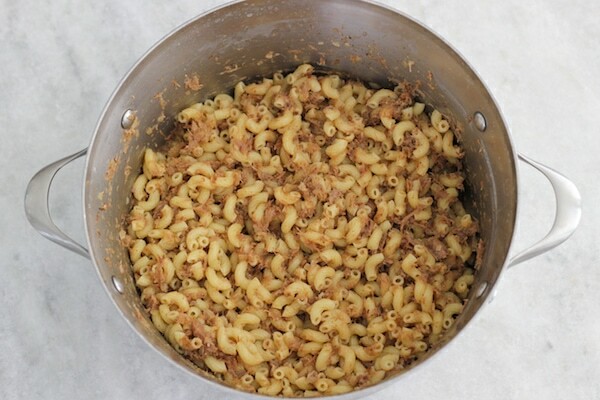 I’m so happy to hear that you enjoyed the Pulled Pork and Macaroni po Flotski:).